The most important criterion on choosing the best motorhomes is not the price, but that the supplier has good, reliable, well-maintained and new vehicles. There is nothing more annoying than to lose 2 days because of a breakdown. There is no MOT in Australia so it's best to hire new vehicles. Stay away from WickedCamp (frequent backpacker choice): their fleet is old, poorly maintained, insurance is a rip off, poor quality and often dirty vehicles. Check where you can return the vehicle with the campervan hire company. The larger providers have depots in Sydney, Melbourne, Adelaide, Brisbane, Cairns, Darwin, Perth, Broome, and Alice Springs. Those who do not return the vehicle at the agreed place must expect to pay a very hefty one-way fee. Book on time. During the high season or the Australian school holidays, the best motorhomes Australia has to offer are snapped up quite quickly. Likewise, larger providers have automated pricing that drives up the prices when the vehicles are in high demand (up to AUD600 per day per camper). Allow adequate time for handing over or collecting the rental vehicle, especially for campers, 4WDs, campervans and boats (at least 2 hours, 4-5 hours for boats). For shopping as well as getting to and from the pick-up station may all take longer than you think. Before you go camping in Australia, make sure you cover yourself with everything you need by shopping in the larger towns. In the Outback and in sparsely populated areas you will only find the bare essentials and fresh produce of whatever is grown in the local area. For example: If you want to spice up your meal with chilli or smaller-sized seasonings (because of the small capacity of the fridge) it’s best to buy them in the big towns. In addition, you often have to rely on making short trips to the shops (09: 00-16: 00) which are closed on Sundays and public holidays. When the weather is good and there are just five customers a day, a petrol station or supermarket owner likes to go fishing and will close the premises. Take a torch / headlamp. Get mosquito spray (the higher the DEET content, the more effective the protection, maximum 40%,) and insect spiral lights. Buy a cigarette lighter USB charger with 2 USB ports so you can charge your devices. Important: one of the ports must have 2AP so you can charge your smartphone twice as fast without harming its battery. Electricity is usually only available via a cigarette lighter (12 volts) or if you stay overnight at a campsite. Refrigerators often run on gas for RVs (one gas bottle usually lasts for a week, but the gas pressure should be checked regularly) or an additional battery, which has to be recharged by driving the RV (lasts 2-3 days). All refrigerators usually have a freezer as well, which is especially useful for keeping meat and fish. If you need more cooling capacity, you can buy a cool box for 20-40 euros. You can get ice in every petrol station or supermarket. Ice will last for 2-3 days. Get a Hema card for your journey. These are Australia's best maps and include all the relevant information, attractions, petrol stations including diesel and unleaded, opening times, water, shopping, camping sites, electricity, etc. Download the Wikicamp app on your smartphone. This app shows all the campsites and campgrounds in Australia with real user ratings. You can find all the necessary information about a campsite, whether it has for example any washing machines and dryers, gas filling facilities, gas grill, waste disposal points, etc. In addition, you can directly download the route on Google Maps or other navigation-related apps. Phone numbers, websites, etc. are also included. 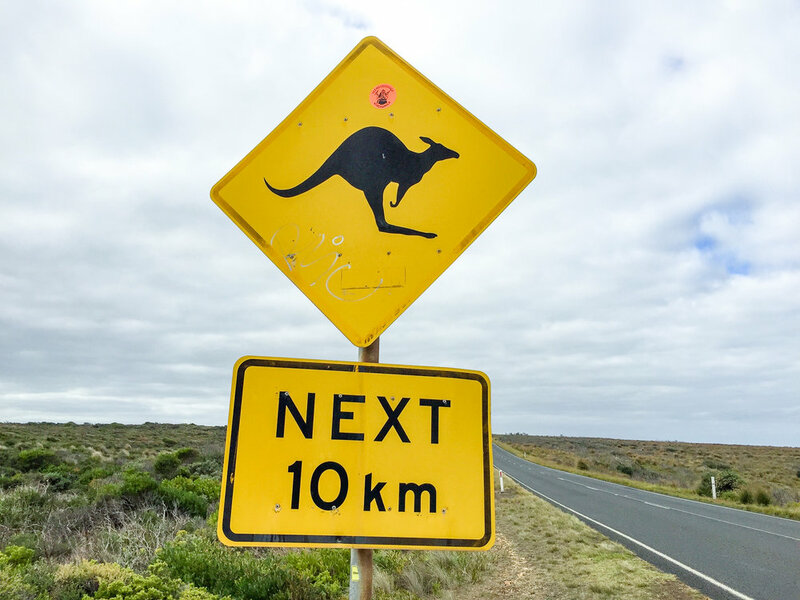 The usual speed limit is 110km / h.
Driving in Australia is more relaxed than in Germany, even in big cities (Sydney is more relaxed than Berlin, even when it's the busiest). Traffic much more relaxed and slower. Roads are twice as wide, same as in the US. Beware of cattle and horses. There are huge farms with over 60,000 animals that are all wondering what you are doing on their roads! Beware of wildlife, especially kangaroos (sometimes even camels). These are mainly present on the road during sunrise and sunset and can show up suddenly on the road. The vehicle's oil should be checked every 1000km, even if the rental company doesn't tell you this. After all, you don't want to experience a breakdown!